What’s more amazing, that Jimmy Olsen has his own title or that it lasted for hundreds of issues? And I ask that question as a fan of the title (and Superman’s Girlfriend Lois Lane as well). It just seems implausible to me that a side kick with no discernible ability apart from the fact he’s Superman’s friend could carry a title for over ten years. Despite that, or maybe because of it, many comic fans have a special place in their heart for Superman’s Pal Jimmy Olsen. Hell, even the King, Jack Kirby did a stint on the title. This issue is made up of two stories. The first and longest, “The Secret of Harpy Castle,” was written by Leo Dorfman with art by Kurt Schaffenberger. Jimmy, AKA “Mr. Action” has been saddled with Percy, the son of Daily Planet stockholder, on his investigation into Castle Grimm, the haunted home of two Hollywood stars that was disassembled in Europe and rebuilt neat Metropolis. Like a true adventurer Jimmy runs into the castle as the celebrities are being chased out by ghosts. Those same ghosts eventually trap Jimmy and Percy with unbreakable ghostly shackles. What does Jimmy do when he gets in over his head? He calls Superman, of course, but in this case the ghost actually calls Superman because they’re not afraid of the Man of Steel. Crazy, huh? Their bravado is well founded because the ol’ Supes can’t doing anything to free Jimmy or beat back the ghosts, leaving it to Jimmy to figure out the solution, which he does. Hey, it IS his title after all. 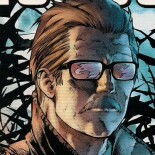 He also makes peace with the ghosts and figures out how to make them happy once again (with Superman’s help of course). Next is “The Shadow From the Grave” also by the team of Dorfman and Schaffenberger, that begins with Jimmy’s birthday party. Which birthday? No one says, but there are plenty of girls there because holding the title “Superman’s Pal” is a better chick magnet than walking a dog in the park. There is also an old lady lurking around and she REALLY has a “Thing” for Jimmy, pictures on her wall type of “Thing.” All of those pretty girls and poor Jimmy still pines for someone named Lucy who has been lost in the Amazon for two years. Instead of searching for Lucy in this story, Jimmy enters a dune buggy race and crashes. Thankfully the old lady is there to rescue him from the crashed buggy and give him mouth-to-mouth. Ewwwww, right? Not so fast, because that old lady is Lucy! What the…?!?!? Fortunately the old lady is in a story telling mood and relates her tale of being lost in the jungle, getting sick and nearly dying. The local indigenous peoples save Lucy with a special potion that has the dastardly side-affect; of rapidly aging her appearance. Of course she can’t imagine Jimmy still loving an old lady and quite frankly, neither can he. In her despair of unrequited love, Lucy jumps off a cliff into a river. A bit drastic, but Jimmy acts quickly and rescues her from the raging river, where they kiss again and Lucy assumes all is right with the world; they’ll be together forever. Jimmy’s thought balloons aren’t so sure about that, but the issue ends there so only people who read #161 know what happened. If you’re one of those people, please leave a comment and let me know since I don’t think I’ll ever find #161. This really was the better of the two stories. 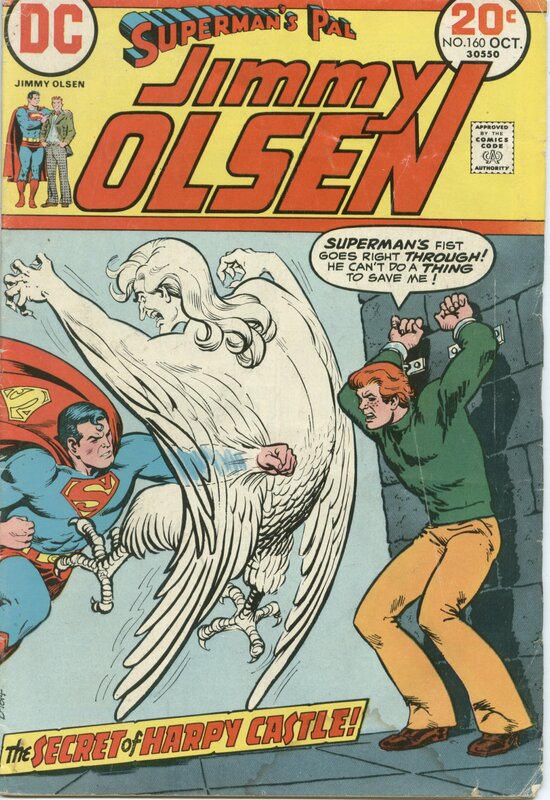 If you’ve never read Superman’s Pal Jimmy Olsen before you can probably imagine what they’re like and not be too far off; kind of corny, some action, some humor, a little melodrama and plenty of visits from the last son of Krypton. What else would you want? I’m a big fan and will buy Jimmy Olsen or Lois Lane any time I find them reasonably priced. This entry was posted on July 13, 2012 by briandettmann in Comic Book Review, Comics, DC and tagged 1970s, bargain, comic, comic book, comic book reviews, comics, DC, jimmy olsen, old, review, reviews, Superman.